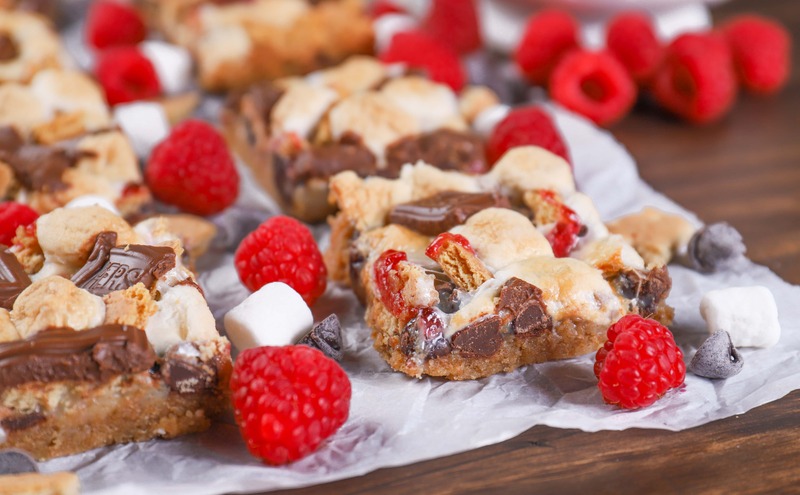 These Raspberry S’mores Seven Layer Bars have all the flavor of a gooey s’more with the fruity addition of raspberry preserves! 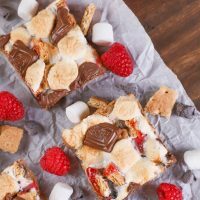 Sweet and salty graham cracker crust and pieces, combined with toasted marshmallows, swirls of raspberry, and pockets of melty chocolate! School supplies are out. Halloween candy has made an appearance. And I just heard a lady say that she couldn’t wait for Christmas. Well, I can wait for Christmas. I am perfectly content soaking up these Minnesota summer days for a little while longer. And, as you know, summer = s’mores at our house. 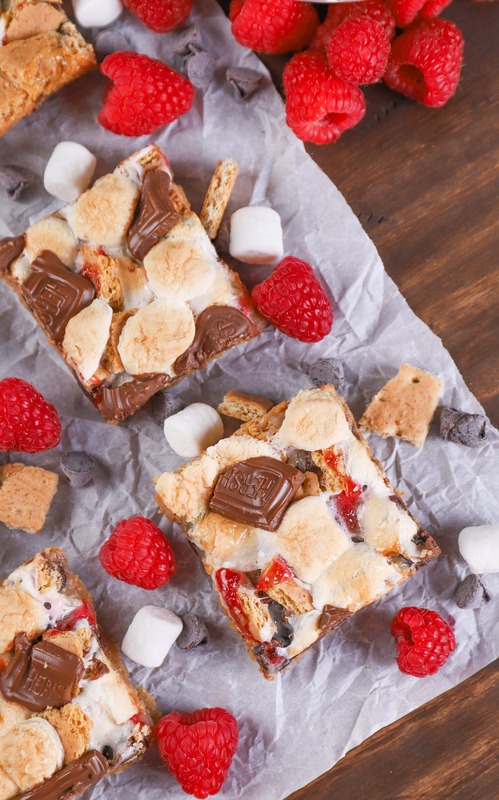 Whether it’s in some form of a dessert, breakfast food, or snack, s’mores make an appearance all summer long around here! And our newest way? 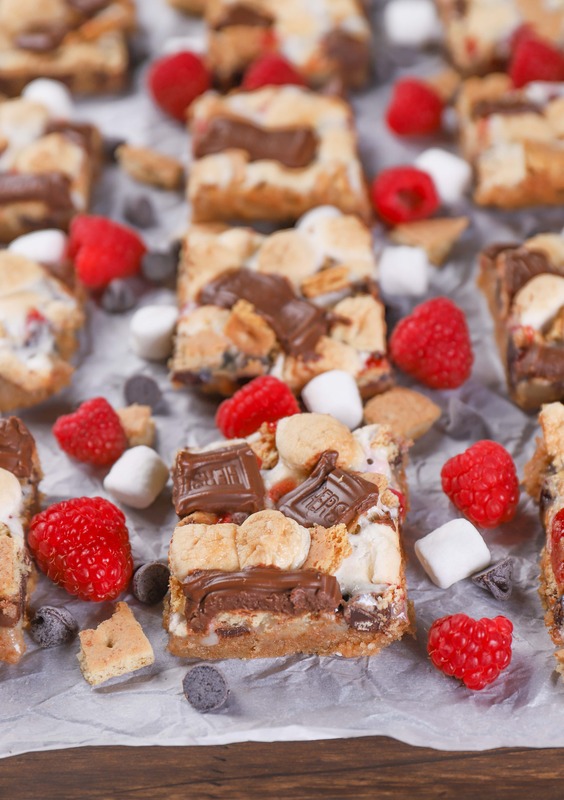 These raspberry s’mores seven layer bars. While our original s’mores seven layer bars still make an appearance at least once a summer, we’ve switched them up already with peanut butter s’mores seven layer bars (If you like peanut butter cup s’mores, you have to try these!) and now by adding fruit! Tart raspberry preserves pair with melty chocolate and gooey marshmallows to create a new perfect combination of summer flavor and happiness! No fire or mosquito bites required! Do not use soggy graham crackers. The crust will not set up and you’ll end up with soggy bars. 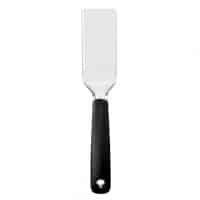 Let the bars set for at least 15 minutes before cutting. The smell will make it really hard to wait, but you will have a gooey, sticky mess if you don’t wait. Use seedless raspberry preserves to avoid having the crunch of the seeds in each bite. Love the white chocolate raspberry combination? Use white chocolate chips instead of semi-sweet chocolate chips to switch up the flavor! Preheat oven to 350. 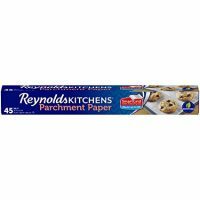 Spray a 9x13 inch baking dish with non-stick cooking spray or line with parchment paper. In a small bowl, mix together graham cracker crumbs and melted butter. Press mixture into prepared baking dish. Spread sweetened condensed milk over the top. Drizzle half of melted raspberry preserves over the top. 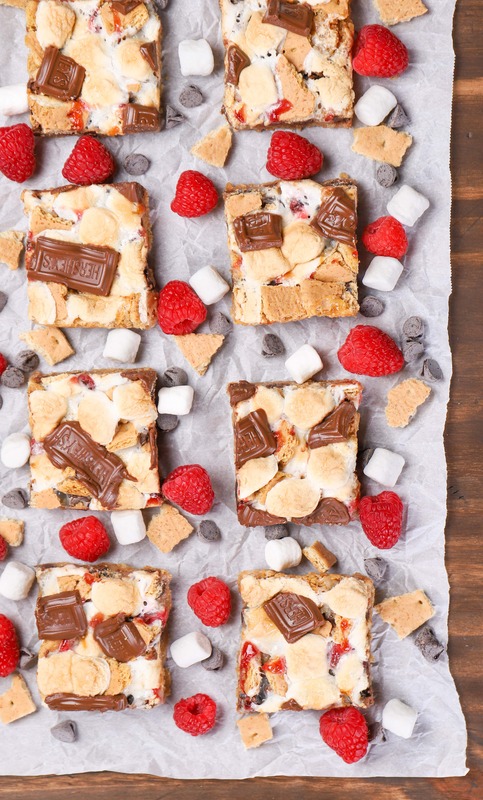 Sprinkle half of marshmallows, all of the chocolate chips, and graham crackers over the top. Bake for 15 minutes. Carefully remove from oven. Drizzle with remaining 2 tablespoons of melted raspberry preserves, and sprinkle with remaining marshmallows. Bake for an additional 10-15 minutes or until marshmallows are browned and edges are golden. Remove from oven to a cooling rack and place chocolate pieces on top. 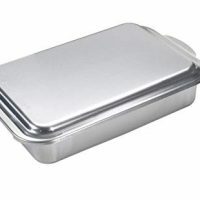 Allow to cool for at least 15 minutes before cutting into pieces and serving. Bars will still be gooey but will hold together. For best results, allow to cool completely.